Kudo Naoko (b. 1935) was born in Taiwan. She studied education and Chinese literature at Ochanomizu University. She then worked as copywriter, first at the advertising company Hakuhodo, then freelance. She began writing poetry in her twenties. 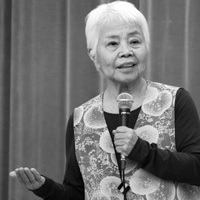 Her book Lion the Philosopher won the Japanese Children’s Literature Association’s Newcomer’s Award in 1983. She does fables and children’s books as well. Ms. Kudo also does textile crafts and bamboo weaving. Some of her craft patterns can be seen reproduced on the cover of her poetry collections. Her current projects include editing Nohara no uta (Songs of the Field), a series of poems written by children. Her son is the manga artist Taiyo Matsumoto whose work includes Black and White. Her poems take place in a world of myth and fable, often featuring talking animals. Light-hearted and gently funny, her work is also deeply thoughtful and compassionate. Translator Marianne Tarcov graduated from the University of Chicago in 2006 and spent the following year as a Fulbright Fellow at Kanto Gakuin University in Yokohama.